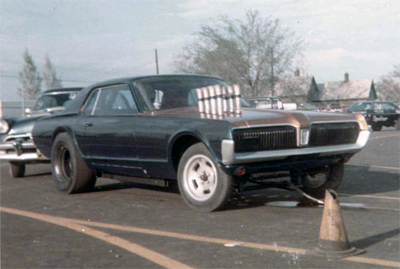 Here’s a pic of the Cougar from early ’68. Looks like the mechanicals are done and they are shaking the vehicle down. 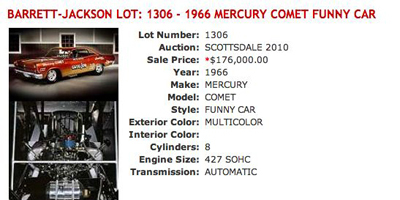 Here is a link to the Barrett Jackson web site. 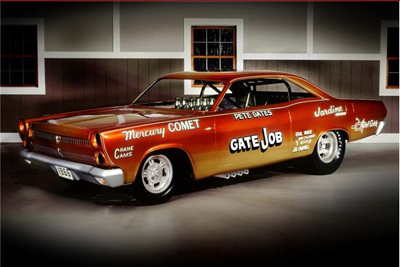 The link is to the Pete Gate ‘Gate Job’ funny car. Sold for $176,000.00. Why post something here about that vehicle? This car was purchased by my Dad back in the late 1960’s. 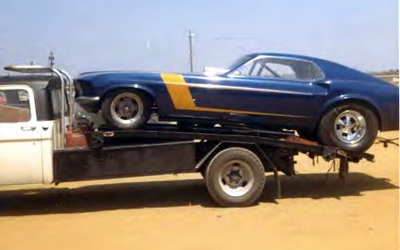 He sold off the bits he didn’t want or need, had his Mustang body built and mounted on the chassis of this car. Images of that vehicle, the 1969 Mustang, can be found elsewhere on this site. 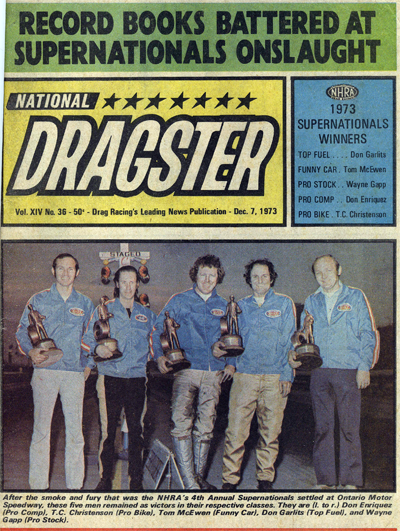 Here is the cover from the December 7, 1973 issue of National Dragster. Note the smiling guy on the far right. Supernationals winner. After the smoke and fury that was the NHRA’s 4th Annual Supernationals settled at Ontario Motor Speedway, these five men remained as victors in their respective classes. They are (l. to r.) Don Enriquez (Pro Comp), T.C. Christenson (Pro Bike), Tom McEwen (Funny Car), Don Garlits (Top Fuel), and Wayne Gapp (Pro Stock). This shot, I believe, is from the article that ran in one of the popular magazines of the day. Here is a nice 3/4 angle shot of the ‘Taxi’ showing some good details of the vehicle. One of the discussions that I have read about over the past is the actual name of the car. I don’t know the reasoning for the name changes. Some of have stated it was pressure from NHRA to change it from ‘Tijuana’ to ‘Juana’ or just plain ‘Taxi’. I doubt it. The reasons for the changes are lost in time. It just had to end up being a battle of the “factories” as the Fords of Gapp and Roush, Nicholson and Glidden and Allen were looking mighty strong over the Mopars of Reid Whisnant, Oscar Roberts and Irv Beringhaus and the others. The Vegas of Paul Blevins, Grumpy, Lynn Harrison and Sonny Bryant’s ‘lonely big block’ had their work cut out for them for the Chevrolet camp. Bob Riffle’s 9.48 – 145.16 was too much ofr the Duster of Oscar Robert’s car Roberts 9.65 – 142.40. Next up was Royce Freeman who drew some tough competition from Reid Whisnant and his Duster. Freeman’s 9.84 – 136.78 was enough to make a spectator out of Whisnant with his 9.95 – 141.95. Lynn Harrison’s Vega twisted a 9.67 – 139.75 off to beat William Parris and his Demon’s 9.78 – 140.62. Grumpy ran a 9.34 – 145.86 to trailer Don McLavey’s Demon at 10.03 – 138.46. Wayne Gapp in the Gapp and Roush Pinto turnon on the Ford fans by beating Irv Beringhaus’ Duster 9.41 – 147.05 to a losing 9.84 – 139.53. Sonny Bryant’s big block Camaro fell victim to the small block Vega of Paul Blevins 9.39 – 144.69 to Bryant’s 9.71 – 141.95. The ‘Ford Camp’ further cheered on for Bob Glidden and Pinto as it easily put away the Duster of John Hagen. Glidden garnered low e.t. of the round (and the meet thus far) with a 9.28 – 146.81 to Hagen’s 10.03 – 136.15. Nicholson drew the bye and cut a 9.40 – 145.16 as only 15 cars made the call for the first round. Glidden further enthused the Ford lovers by downing Paul Blevins 9.37 – 146.34 to 9.45 – 145.39 to open round two. Jenkins primed the Chevrolet fans once more by defeating the Dodge Sport of Bob Riffle 9.33 – 145.63 to Riffle’s 9.58 – 144.69. Nicholson’s 9.39 – 147.54 was more than enough to win over Royce Freeman’s 9.78 – 138.61. Gapp and Roush closed out the round by shutting down Lynn Harrison’s Vega 9.23 – 147.29 to 9.72 – 139.53. Another Ford over Chevrolet win and another…yet lower e.t. meet/track record for Gapp and Roush…and remember these times are at 3700 feet altitude (and are unfactored except in the case of a new national record)! It had come about with the way the Fords were dominating the scene…in a semi-final round it was 3 Fords versus the Chevrolet of none other than Bill “Grumpy” Jenkins. The first pairing of round 3 saw Gapp and Roush square off against a car they built…the ‘like-Pinto’ of Glidden and Allen. Kinda’ tough to ‘run what ya brung’…and ‘what ya’ built’…but so goes it! Gapp took the win and a ‘triple timer’ low e.t. of 9.22 at 146.57 to Glidden’s 9.31 – 146.34. Grump trailered Dyno with a 9.34 – 145.39 ‘go’ to Nicholson’s 9.37 – 144.92 to create the ‘factory showdown’ final! The Ford fans were ‘quivering’ with excitement as Grumpy was no ‘light hitter’, but the blink of a green, Gapp was gone and Grump in pursuit. 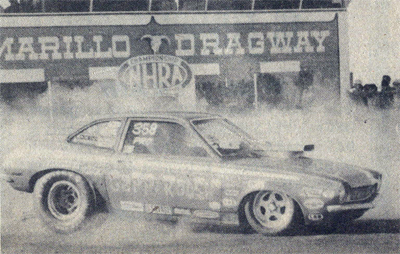 It’s not often one ‘cuts a light’ on Grumpy but Gapp did it with the excellence of a surgeon and ‘put a Pinto’ in the winner’s circle with a win and a new national records!! 9.17 – 149 flat to Jenkin’s 9.35 – 145.86. The 9.17 factored (again, due to the altitude of 3700′) becomes a 8.89. 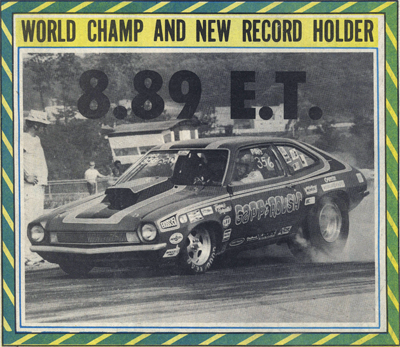 So, Gapp not only beat Jenkins but he also eclipsed the Grump’s national record of 8.91 with their 8.89 – Ford definitely ‘had a better idea’ with Pinto and Gapp & Roush. AMARILLO, TEXAS — Ralph Hansen, President of Accel, shakes hands with Wayne Gapp congratulating him on his Pro Stock victory. AMARILLO, TEXAS — Edelbrock factory representative Bobby Meeks congratulates team owner Wayne Gapp on his outstanding Pro Stock Victory. This is the cover from the edition. Not the car that was used in Amarillo. This is the car they bought from Barrie Poole and rebuilt. They were flying that day. Here’s a link on this site to another entry about this race.